A rogue warrior. A young leader. Together, they’ll save their world… or watch it burn. Rizelya has her own prophecy to deal with. An ancient enemy is poised to destroy them all, but a small sliver of hope remains. If Rizelya can find an old ally that hasn’t been seen for centuries, they might just have a chance. Ancient Allies is the second book in a series of action-packed, epic magical fantasy novels. 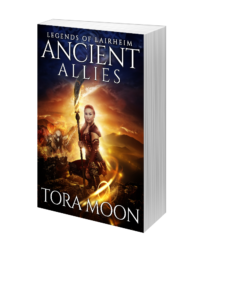 If you like strong female lead characters, compelling shapeshifters, richly built worlds, and death-defying quests, then you’ll love Tora Moon’s Legend of Lairheim series. Read Ancient Allies today to join the fight against the forces of evil! Now available at your favorite retailer! When you join my Fantasy Reader’s Club, you’ll receive Ancient Enemies free, plus get more stories, bonus content, and advance notice when new releases are available. If you like ferocious shapeshifters, masterful story arcs, and intriguing magic systems, then you’ll love Tora Moon’s Legends of Lairheim series.